Andrew and I left Oakland on Wednesday around 1pm, flying to Ontario first on our way to Norway. The flight was nice and comfortable, and I was surprised with how nice Air Canada was. We arrived in Ontario, hurried over to the other gate, and got on the much longer flight to Frankfurt, Germany, also on Air Canada. I think that airline is my new favorite – the airplane food was actually good and they had a choice of movies to watch. I tried to sleep on the flight, but think I only got about an hour. The plane landed about 20 minutes late, and for all the hurrying we could do, the damn Frankfurt airport is a labyrinth and we missed the flight to Oslo. So we had to re-navigate the labyrinth up to the customer service office to get another flight for 2.5hrs later, go through customs about 3 times, and finally get to the gate of departure, where we both promptly sat down and fell asleep. We almost missed the flight to Oslo because of that, but woke up just as the last people were boarding, and some Norwegian guy was laughing that we looked to comfortable to wake up. The flight to Oslo was uneventful I think – I don’t really know because I continued my nap. 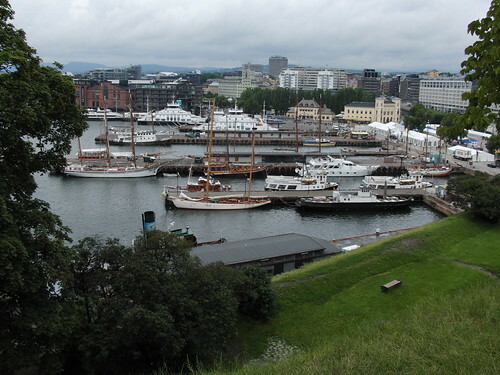 Landing in Oslo, we collected our luggage and took the train to the city center, which cost around $15 to go 20 miles – our first introduction to the Kroner vs. the $. The train station was nice and close to our hostel, so we walked over to the 2 star 'hotel' we were staying at, located rather centrally in Oslo, checked in, dropped our crap, and headed out around 10pm while it was still light, accompanied by some random Japanese dude who was staying in one of the other bunks of the room (he was in Norway for the Orienteering competition in Trondheim). After 24 hours or so of travel, we really didn’t have all that much energy and ended up back at the hotel by midnight, stopping along the way for some beer at a local piano bar of all places. The singer did a rendition of Bohemian Rhapsody that was pretty awesome. The following day (Friday by now), we awoke early to shower, eat, and get ready to see as much of Oslo as we could prior to our train to Åndalsnes leaving at 2ish. It was surprisingly easy to wake up, so we got an early start. 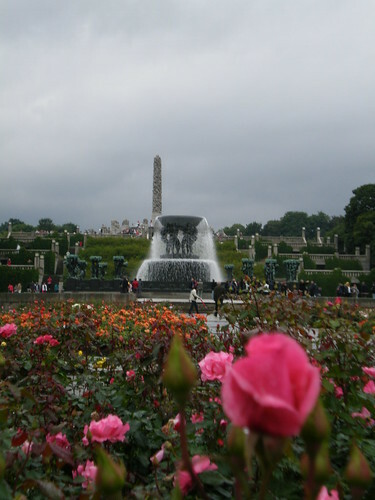 We first walked over to the Vigeland Sculpture Park. 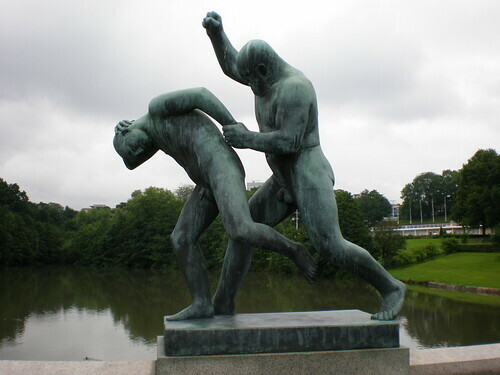 This park has 200 some bronze and granite statues of people doing odd things. It was quite a sight really, and I didn’t really expect it to be as cool as it turned out to be. After the park, we headed back to the center area of town, intent on seeing the Akershus Fortress. The castle in this fortress was built in the late 13th century, and used until 17th or 18th century, when it was apparently allowed to ‘fall into decay’ as they put it, and not restored until the late 1800s. The restoration seemed to be more for function than historical accuracy, and it turns out that the fortress is actually used by the Norwegian military (as well as the tourist industry). It was also used as a prison for some time, where the prisoners could be rented out as a workforce! After the fortress, we walked over to the Oslo Cathedral to see the main church of Oslo. I kind of expected a more gothic crazy building, with some viking influence or so (like a longboat for a roof), but was instead we saw a rather bland church, and only from the outside, since they were only open 3:30pm until midnight. So that left us with a bit of time to wander about, and Andrew bought some new shoes to replace the extremely worn out pair he had came with. After that, we collected our bags from the hotel and headed over to the train station, boarded our train, and started progressing up north. 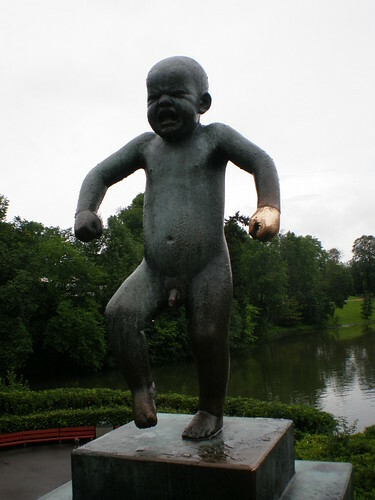 Like I said, weird sculptures.